Of course, there are degrees of evil among governments; some are worse than others. One that steals and spends half of all we earn (as today, here) is clearly worse than one that fritters away only a fifth, as did US governments (at all levels) one century ago. One with some semblance of judicial accountability (open trials, jury verdicts) is better than one run by police behind closed doors. That doesn't say that merely reducing government scope and power is worth the huge effort needed to achieve any noticeable change is worth it; it merely notes that less evil is preferable to more evil. Quite probably, what eventually emerges in Egypt will be preferable to what life has been like for three decades, and right now everyone there seems very happy at that prospect. Good luck to them all! It was a huge effort, with remarkably little bloodshed, and they deserve all the improvement that they get. As noted at the end of Mubaraktomy, though, it cannot be much; it exchanges one government for another, in some form or degree, nothing more. 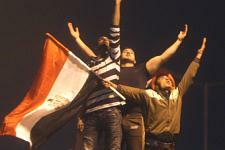 Egyptians will no more get their lives back than we will. Each will still be ruled by someone else. Real freedom comes not from changing the political players, but from removing their stage. In Mubarak's dramatic final few hours, on Thursday night he said Hell no, I won't go; but next morning, he was gone. So somebody had told him to go, and it could only have been the military commanders. A very angry crowd was heading for the palace, and I speculate that he was told that should they storm it, the army would not fire upon the protesters. Therefore, he had to go. Why would the army not shoot? - because among the lower ranks, the grunts who would do the shooting, they were taking off their uniforms and joining the rebels. I heard that broadcast only once, so it could be wrong, but I think that's the factor that tipped the balance. Government employees, at a critical moment, were declining to follow orders; and so the commanders had to tell the boss they could no longer defend him. Support was withdrawn. Such withdrawal of labor, but on a vastly greater scale, is what will bring about the end of the government era here. Removing its revenue (tax strikes) won't suffice, because it can merely print money. Disobeying its laws will help - but later on, for now it can build more prisons, hire more thugs, lock the dissidents away or, for that matter, shoot them. What government can not withstand is the resignation of its staff. When nobody is willing to work for it, it will cease to exist. Understanding what you do about government, human nature, work and reward, freedom, would you work for it, in any job at all? - of course not. Nor would anyone else, who understands those things. Therefore, the whole task comes down to educating everyone about them. Sounds formidable - but it's not! With some help from a good interactive school, you could educate one of your friends a year, right? Then he could do the same. And that's how it's being done, each one bringing one and showing how to bring another. It's called exponential growth. By my count, the job will be done by 2027. In one piece about Tahrir Square, the CS Monitor wrote "The unprecedented popular uprising... succeeded in large part because it became a grass-roots movement that could not be contained, negotiated with, or controlled through a few leaders." Exactly. So will ours.